Investigators concluded that a Britten-Norman Trislander that suffered runway excursion during an aborted takeoff in New Zealand in 2011 was too heavy and wrongly loaded with the centre of gravity significantly outside the permissible limits. On 22 October 2011 a Britten-Norman BN.2A Mk.III-2 Trislander was scheduled for a scenic charter flight from Pauanui Beach Aerodrome in New Zealand. The aeroplane was operated by Great Barrier Airlines. On board were 13 people. The pilot applied full power for the take-off but was unable to get the aeroplane airborne, so she abandoned the take-off and applied full braking. The aeroplane did not stop before the end of the runway and went through a low wooden rail marking the end of the runway, stopping with its nose wheel in a garden just 3 metres short of a public footpath. Nobody was injured and damage to the aeroplane was minor. The Transport Accident Investigation Commission found that the main reason for the aircraft not getting airborne was that its centre of gravity was significantly outside the permissible limits. The pilot’s take-off technique and, possibly, increased resistance from the wheels of the heavy aircraft on the runway surface were other factors that contributed to the aeroplane over-running the end of the runway. The Commission also found that the required margin for a safe take-off was not met because the aeroplane was too heavy for the available runway length. This was a reason for the aeroplane not stopping before the runway end after the pilot had rejected the take-off. 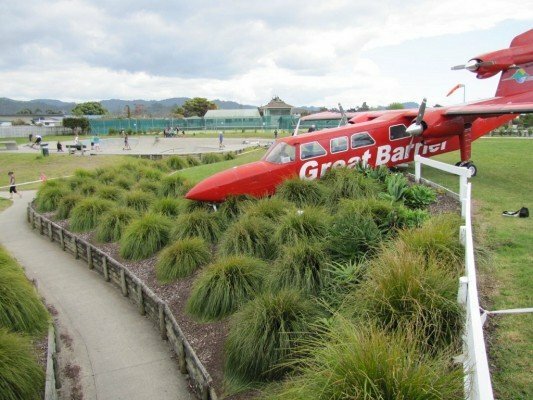 – the Thames-Coromandel District Council had not evaluated the effects of a subsurface runway irrigation system on the maximum equivalent single wheel load (ESWL) for the Pauanui Beach runway. The Commission has made recommendations to the Director of Civil Aviation and the Chief Executive of the council to address these safety issues. – it takes more than just good written policies and procedures to achieve an acceptable level of flight safety. Managers need to lead by example and ensure that pilots actually follow the procedures.